I travelled from Los Angeles to Mumbai on Etihad Airways and thought of sharing my experience with you. This was my first flying experience on Etihad Airways. It was a long flight so probably the best one to review! In this video I am sharing a part of my Etihad Airways flying experience with you. My flight was from Los Angeles to Abu Dhabi and thereafter to Mumbai. And this is a video of my flight from Abu Dhabi to Mumbai. Do watch. Flying to and fro from America can quite a task! 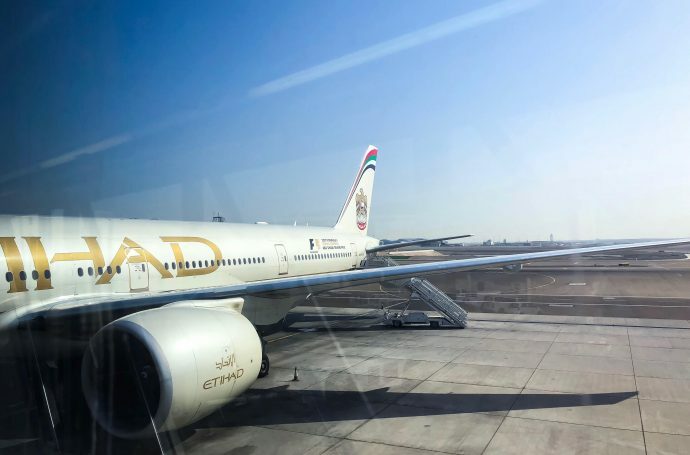 Long flights get the best of me and there are a few things that Etihad Airways did well to deserve this blog post. Firstly, in spite of Economy class, there was a fair bit of leg room. A lot of other flights don’t offer this kind of space. Secondly, the service. Their staff is kind and responsive. You are not left waiting or unanswered. Thirdly, their food. I can say that this is one of the best in flight meals I’ve had. Small things make a huge difference in long flights. And I definitely feel that Etihad Airways does go out of their way to ensure that passengers have a smooth experience. For instance, they served sliced apples as a snack which I thought was very good since food ends up making one feel either too acidic or queasy on flights. I would definitely choose to fly with Etihad Airways once again. And that is irrespective of my flight duration. I would love to know of your flight experience with Etihad and other flights as well. So leave that in the comments below. Here are some of my other in-flight reviews. Finding an Indian meal on Korean Air is indeed a good sign! 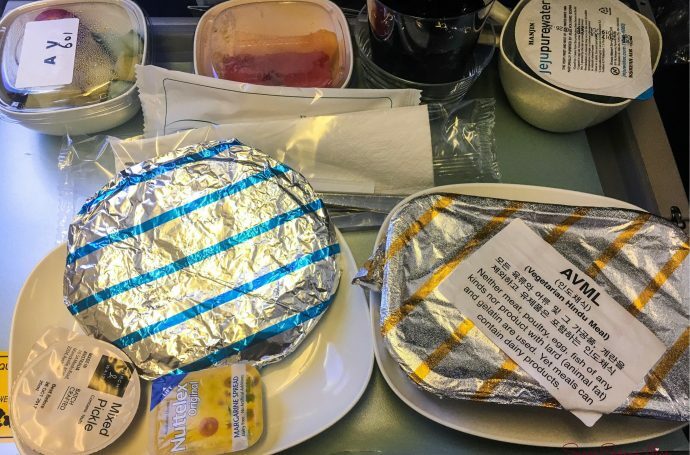 I was travelling via Korean Air from Hong Kong to Korea and although it was a short flight (slightly over 3 hours), everyone on the flight was served a meal. I was asked if I would like fish or chicken in my meal and I said neither, as I had already opted for a Hindu Vegetarian Meal while booking my flight. The crew was absolutely unaware about my request (a massive miscommunication between the booking site and Korean Air) and so I wasn’t served a meal on that flight. However, they made a note of my request and did confirm to arrange a meal on the next flight that I would be taking from Korea to Los Angeles. So yes, finding an Indian meal on Korean Air felt really good. And I’m actually glad that the crew on the first flight decided to help me out here; this second flight from Korea to Los Angeles was almost 14 hours and there’s no way I could have made it without vegetarian food. So a big shout out to the staff of Korean Air for this. Coming to the meal itself, I think it was one of the most non-greasy meals I’ve had on a flight. 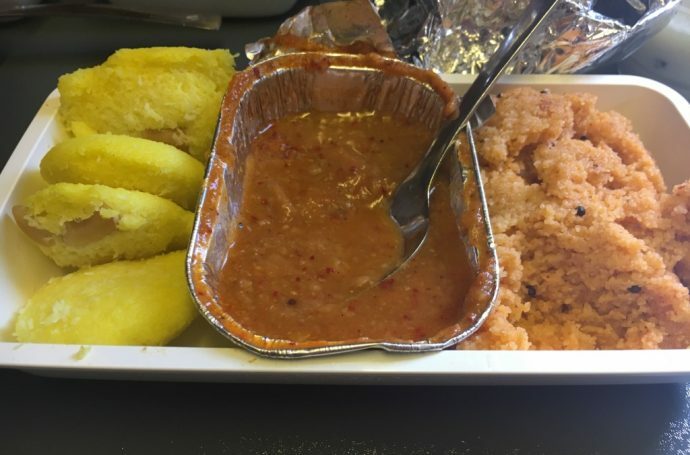 Airplane food isn’t the best tasting and is usually very oily. This meal was actually pretty good in that sense. You can watch this video of all the items I had while I was on the Korean Air Flight. So if you are an Indian vegetarian, and travelling by Korean Air, my advise would be to choose Hindu Vegetarian Meal while booking your flight. And also a day prior to flying just call the helpline and check if they have received your meal preference. It’s extra work, but at least it ensures you have a proper meal while flying. In terms of hospitality and service, I hold the Korean Air staff in very high regard and they honestly go out of their way to ensure you have a comfortable flight. While flying to Singapore, I experienced the Singapore Airlines Indian Breakfast meal and decided to film it and kind of review it for you guys. Here’s my Singapore Airlines Indian Breakfast Review. Watch it by clicking on the video below. Sometime last November, I was heading from Mumbai To Singapore for a small family vacation. So on my flight from Mumbai to Singapore I enjoyed this inflight breakfast in Singapore Airlines and decided to share it with you. While booking the ticket, you get an option to decide what kind of breakfast you want. And I believe the broad options were, Vegan, Asian and Indian. And these options were further broken down into non-vegetarian and vegetarian. I’m a vegetarian and so I decided to play safe and stick to Indian Vegetarian breakfast. Now I have travelled a fair bit and am definitely not the biggest fan of airplane food. I mean I can literally name a handful of flights where the meal has been worth remembering. But, Singapore Airlines definitely have one of the best airplane food that I have tasted so far. It seems pretty close to fresh and has a decent taste as well. Sometimes, airplane food seems really dry and mealy but this wasn’t the case with Singapore Airlines at all. My return flight was Singapore Airlines too, but I was too tired to film and it was also a midnight flight so I just really wanted to sleep in on it! But I hope you enjoyed watching and reading about my Singapore Airlines Indian Breakfast. Do share it with your friends and family, if they are travelling via this airline.